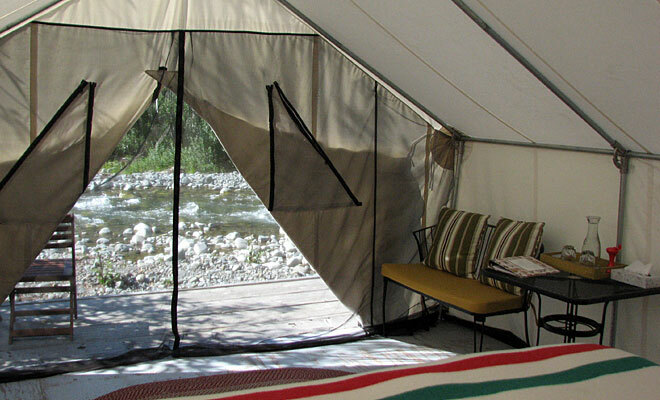 These super-deluxe wall tents are our newest units and have quickly become the favorite amongst those travelers with an adventuresome spirit. 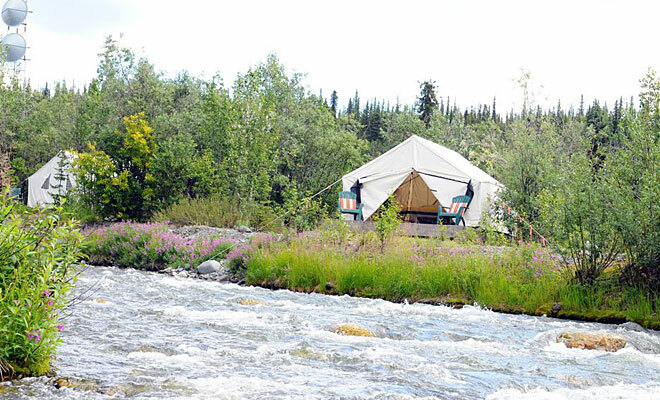 "Unique" is a sadly overused word in the hospitality industry, but we guarantee you that you will not find anything in Alaska comparable to these extraordinary units which pay homage to the mining tents of yore, when Paxson was a camp for miners heading north to the goldfields. They are immense - at 14' x 16' almost the size of the cabins - with a 9' center ceiling. They are on permanent platforms, with decks, and are sited DIRECTLY on the riverbank, the closest of any of our units to the river. 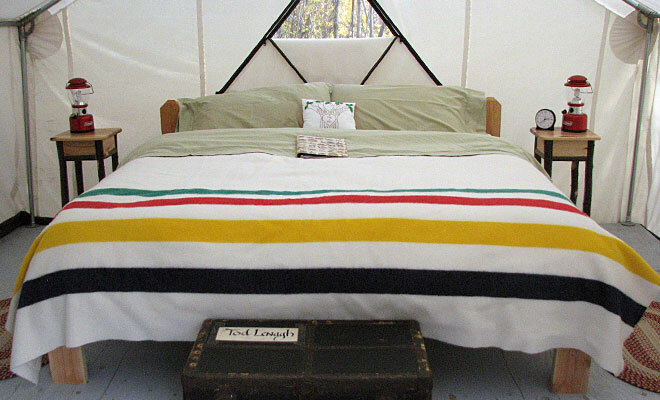 Each bed has cozy flannel sheets and is topped with a down comforter and a genuine Hudson Bay wool blanket, making these beds wonderfully warm even through the coolest nights. 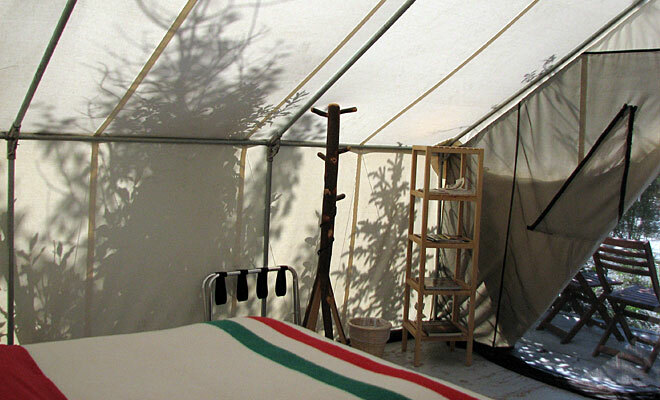 Each tent also has its own dedicated bathroom, decorated in a beautiful rustic chic style, with hot shower, sink, and flush toilet. 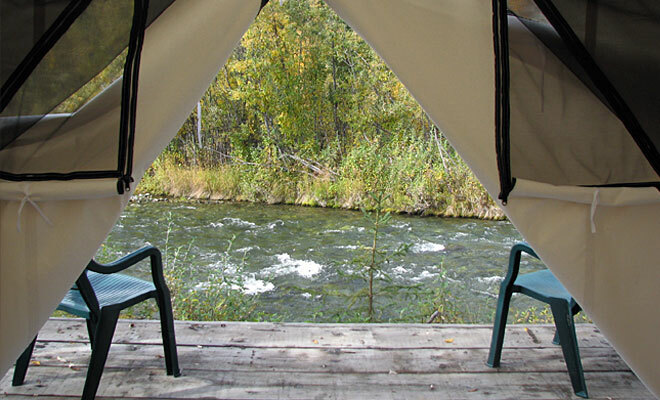 These are a short 35 yard walk away, as we cannot have plumbing along this National Wild & Scenic River. Tenters also, of course, have full access to our Great Room, which is a wonderful place to pass the evening prior to repairing to the tent. 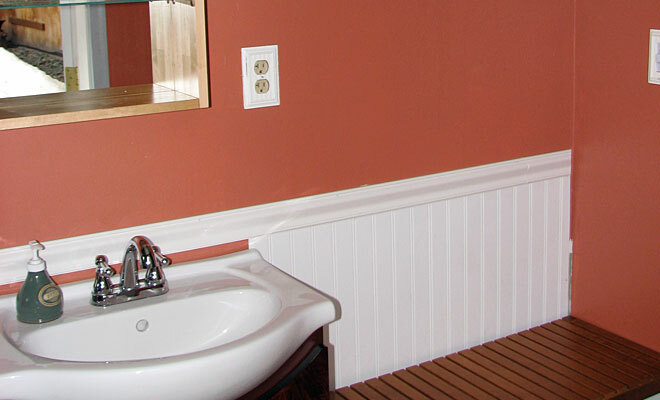 Tenters can charge cell phones and so forth in their private, lockable bathrooms. 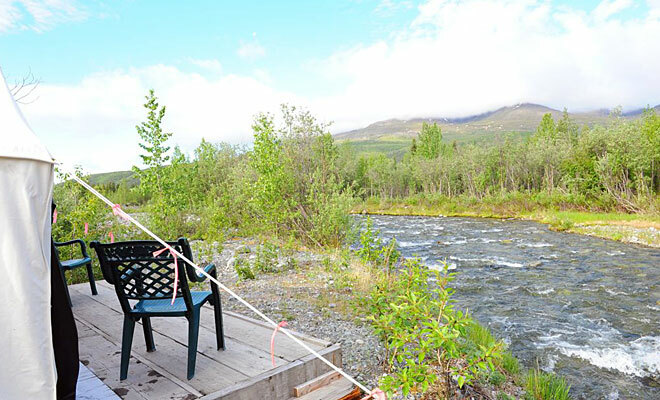 Watch sockeye salmon coursing upstream as you sit in your comfortable deck chairs. Homemade breakfast included. 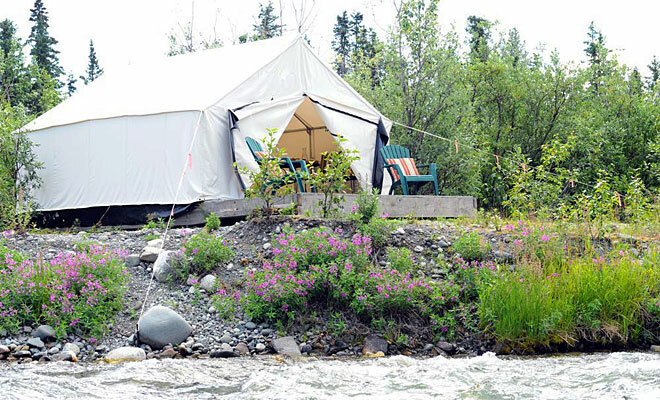 Click on each tent-cabin name below for more information and rates. This tent's name recalls A.J. Paxson's first roadhouse in this area, which was also a tent. 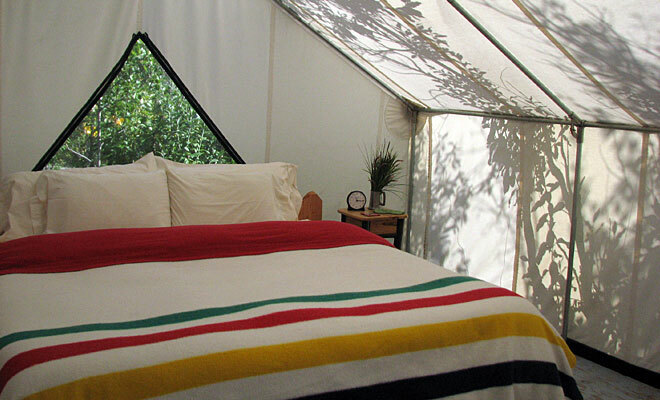 The Timberline has one memory foam king bed and can sleep a maximum of 2 persons. 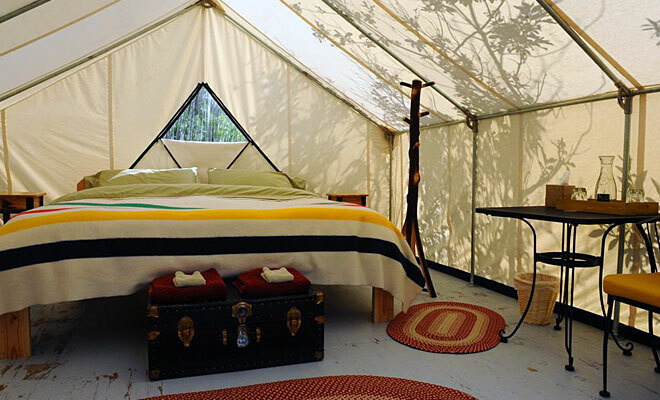 This is our honeymoon tent! 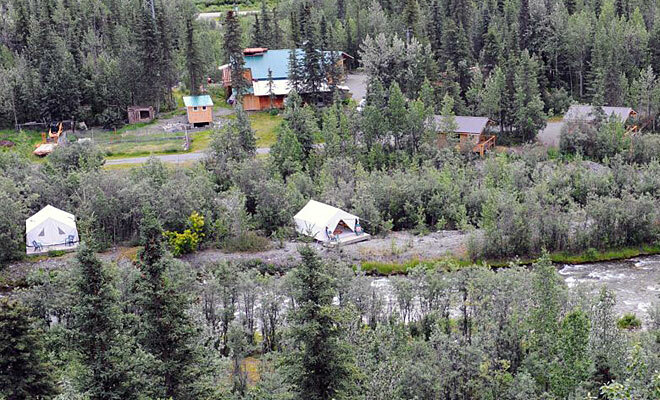 The Timberline has a wide open view of the river and Paxson Mountain, yet is still exceedingly private. Rates below are for two persons, with breakfast, net all tax included. The rate for one person is $160. 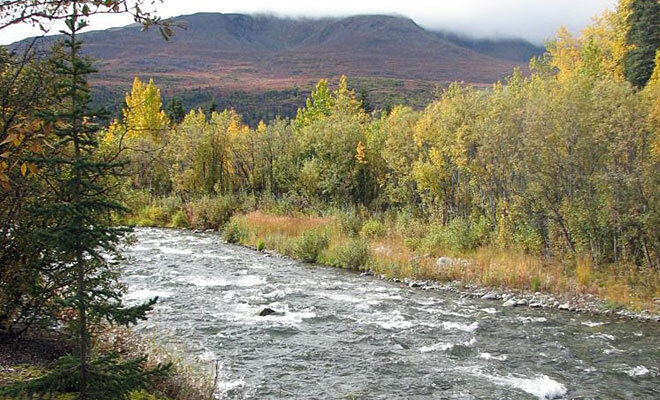 Named after the Gulkana river's famous denizens: Oncorhynchus nerka, the legendary Copper River sockeye salmon. Guests sleep in a solid genuine mahogany sleigh bed, handmade by your host Audie, topped with a Serta Perfect Sleeper queen mattress. There is also one twin bed. 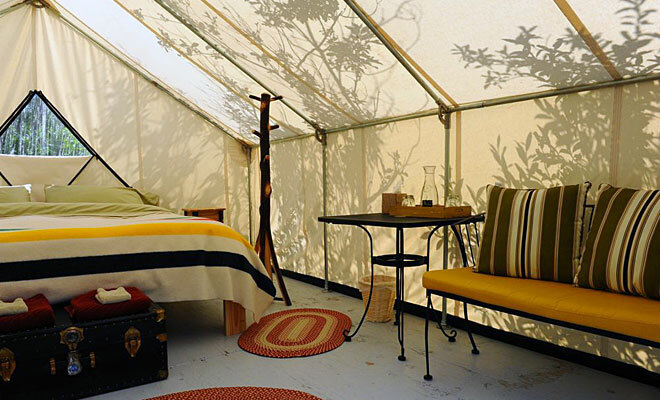 This tent can sleep a maximum of 3 persons. O.Nerka is nestled in the trees right at the water's edge. Rates below are for two persons, including breakfast, net all tax included. The rate for three persons is $235. The rate for one person is $160. Electricity. Battery-operated lanterns are available in the tent, but these are rarely needed in our light-filled summers. 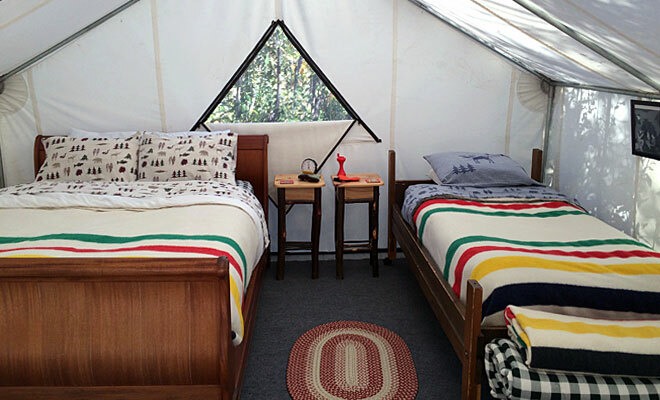 Electrical outlets are available in each tent's bathroom. Heaters. 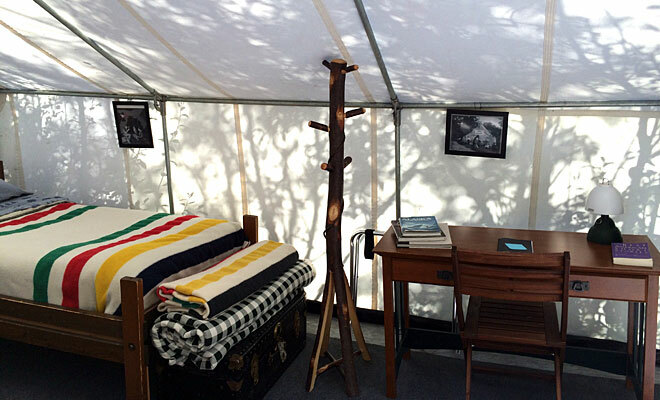 Nights are cool here, but our tent beds are exceedingly warm. 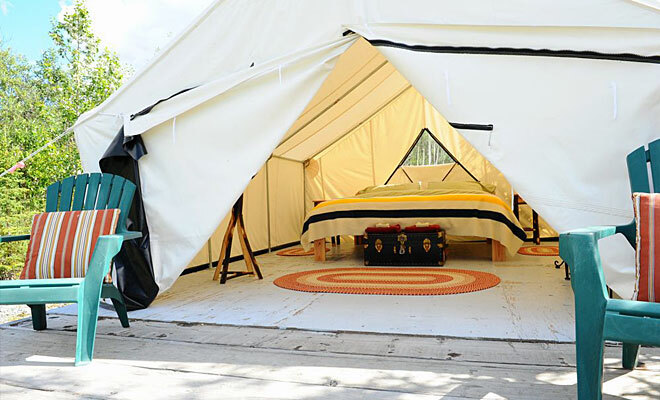 The ambient temperature of the tent will be cool when you awake in the morning. 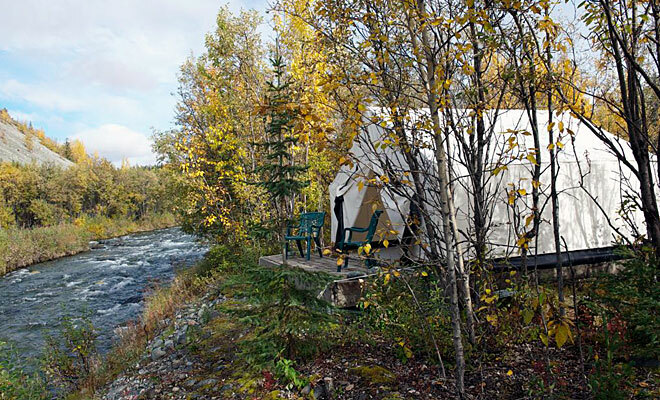 "Paxson is 150 miles from the nearest stoplight, but Denali (Highway) Cabins manages to treat you to all the creature comforts you could possibly want in the wilds of Alaska: immaculately clean rooms with lovely mountain views, super-comfortable beds, close proximity to a creek frequented by wildlife, a talking Malamute, and the most interesting and thorough informational binder I've ever seen in a guest room."